Personnel - Scott Routenberg: piano; Nick Tucker: acoustic bass; Cassius Goens III: drums. Supermoon, the second outing of the trio led by under-the-radar pianist Scott Routenberg, is the follow up to last year’s Every End Is A Beginning. As happened in the previous CD, the new work released on Summit Records, is exclusively composed of originals and features Nick Tucker on acoustic bass and Cassius Goens III on drums. Routenberg, who was not averse to genre explorations in an initial phase of his career (Jazztronicus), provides us with a fine collection of jazz songs inspired by his two sons, Julian and Florian. Opening the program is the title track, which dissipates all types of positive energy. The tune was written for Florian, who was born on the evening of the supermoon, and conveys the liveliness of a child in the form of a colorful rock-based song with boiling drum fills, grooving bass lines, as well as a burning piano ride. Things start graciously feathery on “Everything Is Alive”. Still, the rhythmic and harmonic textures stiffen up for Routenberg’s eloquent solo, eventually returning to the initial quasi-classical docility. Florian’s obsession with trains is illustrated on “Locomotivity”, an uptempo burner in six with a subtle Latin feel and boppish motifs to be enjoyed. This one was co-written by Routenberg and his wife Sofia Kraevska. Both “Quiet Times”, a melodious reflection requiring cohesive interplay, and the closing “Little Song”, a tranquil ballad in which the trio finds room to breathe, have soft, warm-hearted natures, in opposition to the playful “Bebop Baby”, whose swinging verve is pelted with Bird-inspired lines and a rhythmic bounce similar to Benny Green. Tucker also enchants while discoursing in sympathy with Gershwin’s classic rhythm changes. 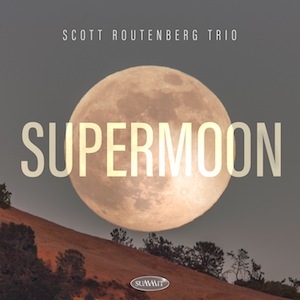 Supermoon is a product of Routenberg’s parental and musical inspirations, but also a work of unified expression from a charismatic trio that shows enough attributes to provide us with substantial moments of gratification.